Caleb Harris enjoys an active career as a pianist, chamber musician, conductor and vocal and opera coach. He is equally at home at the keyboard and on the podium. Harris has appeared throughout the United States, Austria, Germany, France, Italy, Scotland, Slovenia and Asia at many prestigious venues, including Carnegie Hall, Seiji Ozawa Hall at Tanglewood and the National Concert Hall in Taipei, Taiwan. Recent concerto performances include Beethoven’s First Piano Concerto and Triple Concerto, Brahms Second Piano Concerto, and Rachmaninoff’s Rhapsody on a Theme of Paganini. 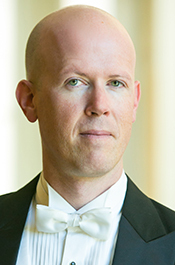 Currently an Adjunct Associate Professor at Vanderbilt University’s Blair School of Music, Harris formerly held positions at the University of Northern Colorado, the University of Utah and Utah Symphony/Utah Opera. His students have won many competitions and awards, including the MTNA state finals, the Colorado Symphony Concerto Competition and the Denver Philharmonic Competition. Harris has been involved in the preparation and performance of approximately 40 operas. Recent productions have included Donizetti’s Don Pasquale, Stravinsky’s The Rake’s Progress, Puccini’s Madama Butterfly, Bizet’s The Pearl Fishers, Puccini’s Turandot, Verdi’s La Traviata, Mozart’s Abduction from the Seraglio, Britten’s A Midsummer Night’s Dream, Poulenc’s Dialogues of the Carmelites, Stravinsky’s Renard and Ravel’s L’Enfant et les sortilèges. Harris has served as instrumental and ensemble conductor and/or rehearsal pianist for the Frankfurt (Germany) Symphony, Dubrovnik Symphony (Bad Homburg, Germany), Utah Symphony, Colorado Symphony, Eastman Wind Ensemble, Eastman Chamber Music Society, Tanglewood Festival Orchestra, University of Northern Colorado University Symphony, University of Northern Colorado Opera Theatre, and Greeley Philharmonic Orchestra. Harris has recorded professionally in a wide variety of genres for Summit Records, Navona Records, Potenza Music, and Acis Productions. He received multiple degrees from the Eastman School of Music and also held fellowships at the Tanglewood Music Center. Harris particularly enjoys his musical and life partnership with pianist Heather Conner, as well as being the father to toddler Logan and baby Emery.